(Bloomberg Opinion) -- I recently argued that if companies won’t pay their workers a living wage, then the government will to do it for them, and in ways they probably won’t like. The latest sign came last week when Senator Tammy Baldwin introduced legislation that would require “public companies to give workers the right to directly elect one-third of their company’s board of directors.” That follows a similar proposal from Senator Elizabeth Warren last year that would allow workers at large U.S. companies to elect at least 40 percent of their company’s board. It’s not surprising that some lawmakers are keen on giving workers a say in corporate decision-making. Co-determination, as it is commonly known, seems like a sensible balance between leaving workers to the mercy of the C-suite and a heavier-handed intervention by government. It doesn’t impose an answer to low wages per se; it merely gives workers a voice in how profits are divided among stakeholders, including them. It also has a long history. Germany has a decades-old tradition of co-determination, as my colleague Justin Fox explains in his terrific two-part history of why German corporate boards include workers and those in the U.S. do not. As he notes, since 1976, Germany has required its large companies to let workers elect up to half of their supervisory boards. There are numerous studies about the economic impacts of co-determination in Germany. While it’s not entirely clear that it has boosted wage growth, economists have found that co-determination has contributed to more stable incomes and greater job security for workers, lower CEO-to-worker pay ratios and less income inequality. Critics, however, contend that those benefits come at a cost. With the power to influence corporate policy, they say, workers will pad their own pockets at the expense of profits. It’s true that German workers are better off than their American counterparts. The average gross hourly wage in Germany was $31 at the end of 2018, according to the German Institute for Economic Research, compared with $28 in the U.S., according to the Bureau of Labor Statistics. Assuming 2,080 work hours a year, that translates into an annual income of $64,500 in Germany and $58,000 in the U.S. The difference is even bigger than it seems because the cost of living is far lower in Germany. A family of four needs an annual income of roughly $52,500 to cover necessities in Berlin, according to UK-based TransferWise, compared with $79,000 in, say, Detroit, according to the Economic Policy Institute. A huge number of U.S. workers struggle to eke out a living. As I previously pointed out, the median employee compensation at roughly half of the largest 1,000 U.S. companies by market value isn’t enough to cover necessities such as housing, food, child care, transportation and health care for a family of four in America’s more affordable locales, never mind sought-after cities such as San Francisco and New York. The list of offenders includes well-known companies such as Amazon.com Inc., Apple Inc., Hershey Co. and Kellogg Co.
It’s unsustainable and a naked long-term risk to companies. Large U.S. companies are enjoying record profitability, so they can afford to pre-empt government intervention by giving workers a raise. But they have a bad habit of overlooking risk when flush with profits, a likely structural flaw. 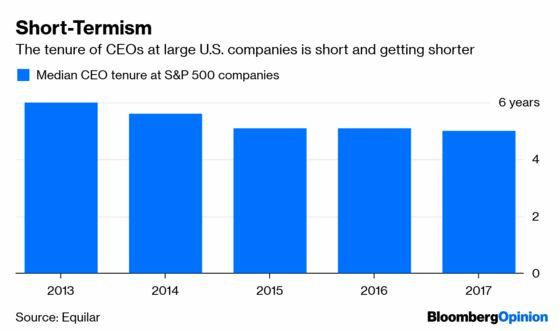 The median CEO tenure at large U.S. companies is five years, and much of executive compensation is tied to stock performance. Paying workers more will almost certainly deflate profits in the short term — and stock prices by extension — thereby derailing the party. As political economist Susan Holmberg has suggested, giving workers a say may encourage longer-term thinking, including on wages. Sure, the median tenure of workers is no longer than that of CEOs — roughly four years, according to the BLS. But unlike extravagantly paid CEOs, workers often don’t have the luxury of walking away or retiring early, so it’s in their interest to make sure that all companies pay a living wage. And contrary to fears that companies must choose between profits and better pay, German companies have generated higher earnings growth than their U.S. counterparts since Germany enacted co-determination in 1976. 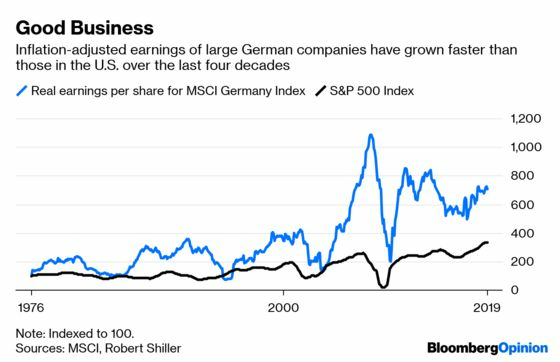 Earnings per share for large German companies, as represented by the companies in the MSCI Germany Index, grew by 7 percent a year, while those for companies in the S&P 500 Index grew by 6.5 percent a year, according to numbers compiled by Yale professor Robert Shiller. German companies performed better over shorter periods, too. Earnings growth in Germany outpaced the U.S. by an average of 0.8 percentage points a year over rolling 10-year periods. In real terms, Germany’s companies fared even better. Inflation was 1.4 percentage points a year higher in the U.S. than in Germany during the period, which means that more of the earnings growth in the U.S. came from rising prices than from companies’ ability to grow profits. Net of inflation, earnings in Germany grew by 4.7 percent a year, compared with 2.8 percent in the U.S. And here, again, real earnings growth in Germany outpaced the U.S. by an average of 2 percentage points a year over rolling periods. Unfortunately, that hasn’t translated into higher returns for German stockholders. The S&P 500 has returned 11.2 percent a year since co-determination became law in Germany, including dividends, while the Germany index returned 9.5 percent. But that’s no fault of German companies. Remember that inflation was higher in the U.S. In real terms, the S&P 500 beat the German index by just 0.3 percentage points a year. And that difference can be attributed more to sentiment than reality. 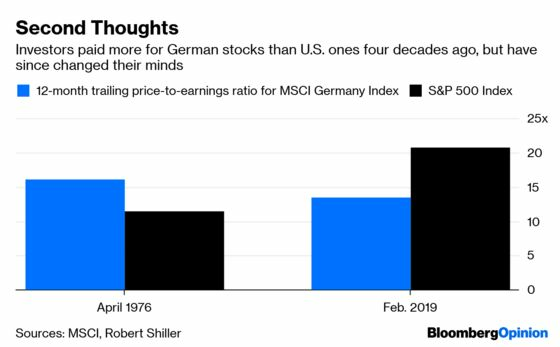 U.S. stocks cost more today than they did in 1976, as measured by 12-month trailing price-to-earnings ratios, while German stocks cost less. When sentiment changes, as it always does, that gap is likely to reverse. Those numbers are consistent with studies finding that co-determination in Germany has had either no negative impact on companies’ performance or a slightly positive effect on productivity, innovation and profits. Let’s also not foreclose the possibility that giving workers a say could be a boon to profits. Indeed, from 1940 to 1979, a four-decade period widely considered the golden age of unions in the U.S., earnings for the S&P 500 grew by 7.3 percent a year. Union membership has since declined and so has earnings growth, falling to 5.7 percent a year since 1980. Of course, many variables drive companies’ performance, and it’s not possible to fully isolate the effects of co-determination. But one thing is clear: If companies won’t look after their workers, giving them a seat at the table is the least intrusion they can hope for.